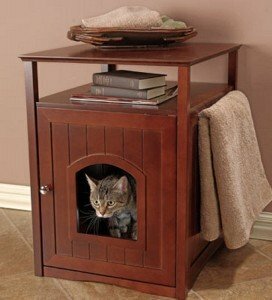 This nice looking piece of cat litter box furniture can be used to hide your ugly cat litter box. 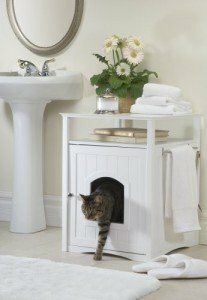 The way the merry pet cat washroom is build it can then be used as a coffee table or nightstand in your bedroom. 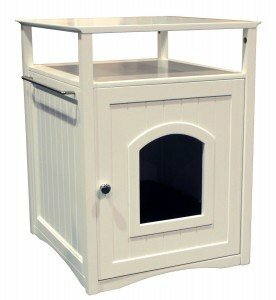 There is room enough inside for a large litter box or for a small pillow if your cat or small dog rather uses it as a place to sleep. 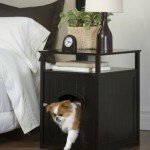 With this merry pet washroom and night stand you can not go wrong. It comes in White, Walnut and Espresso to fit your interior. With over 800 people who wrote something about it we are able to give you a full review here. “Perfect, perfect, perfect. So much nicer than having a litter box just sitting out, even if it was in a bathroom before. Now it’s unobtrusively in a nook in a hallway and blends in. The material is sturdy, a pure white, and doesn’t look cheap at all. Doesn’t get smelly or stained. Did get the IRIS Open Top Litter Box with Shield and Scoop that has high walls and that makes a big difference. I mini-vac some stray unsoiled litter box about once a month, but it stays fairly clean. Unexpectedly wonderful purchase. Like always when we review a product we look at the bad reviews first to see it some remarks keep coming back. In this case we found one thing even in the higher ratings that we think is real important to realize before buying this Merry Pet Cat Washroom and that is that it comes highly recommended to paint the inside first. Second thing we found is that you can only fit a smaller litter box inside and it is not to easy to find one with high walls. Litter boxes who are covered will not fit in here. Some cats are not so good in keeping everything inside the litterbox and pee over the edge. This is why you should paint or line the inside to prevent warping of the wood. Assembling seems to be pretty easy although there were some warnings about the holes not lining up and the used hardware is not that great quality. The metal railing however is real metal and not some painted plastic. Overall our opinion is that the merry pet cat washroom is a nice product and with a few alterations it can work great. Just paint or line the inside unless you cat is very clean and does not pee over the edge. Cleaning seems to be pretty easy with the large door, but I also read that someone complaint about the door coming of every time they opened it. Like always we recommend having a good look at it and if you think it does not work or the quality is not what you expect, send it back immediately. Recommend lining it with plastic contact paper before the first use to ensure it lasts longer. Immediately after assemblying, we sprayed the inside with white spray paint designed to protect outdoor furniture from the elements. You can read all our litter box enclosure furniture reviews here.